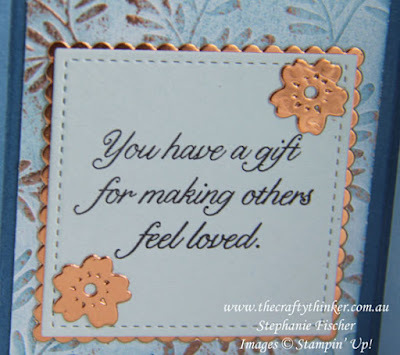 Welcome to the Crazy Crafters Blog Hop with our Special Guest stamper, Cindy Schuster - we are thrilled to have Cindy join us this month and so excited to CASE (Copy And Selectively Edit) any project that has been created by her . Cindy is on the Artisan design team and has been selected for three years running!! What an incredible achievement! We hope you find great inspiration from the projects. This is Cindy's beautiful card that inspired me. 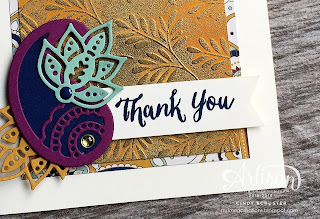 Knowing that this very talented lady is on the 2015-2016 Artisan Design Team gave me an inkling that choosing a card to CASE might be tricky but it turned out to be even more difficult than I anticipated! 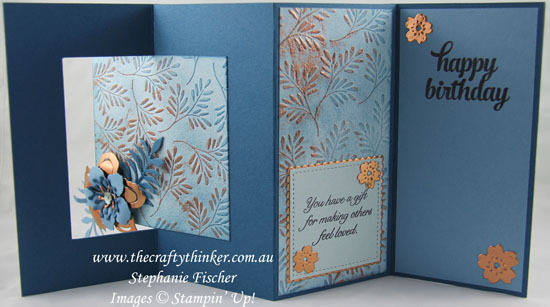 I love the way that Cindy heat embossed and coloured the Fancy Frost DSP so I decided to use my favourite ... Copper embossing powder and combined it with Dapper Denim for a change. Using a light touch, I swiped a Versamark pad across the Fancy Frost paper, sprinkled with the copper embossing powder and heat embossed. I then sponged with Island Indigo ink followed by a very light touch of Dapper Denim over the raised areas. I then cut the piece to size and sponged the edges with Dapper Denim ink. 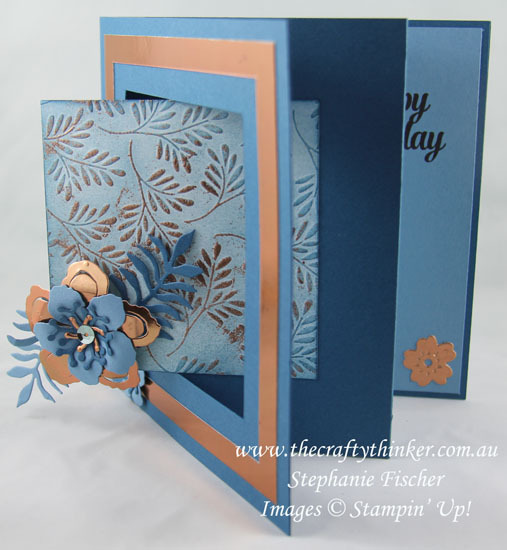 I then made a swing fold card using Dapper Denim cardstock. I added my Fancy Frost paper to the centre front and a frame of Copper Foil Sheet. 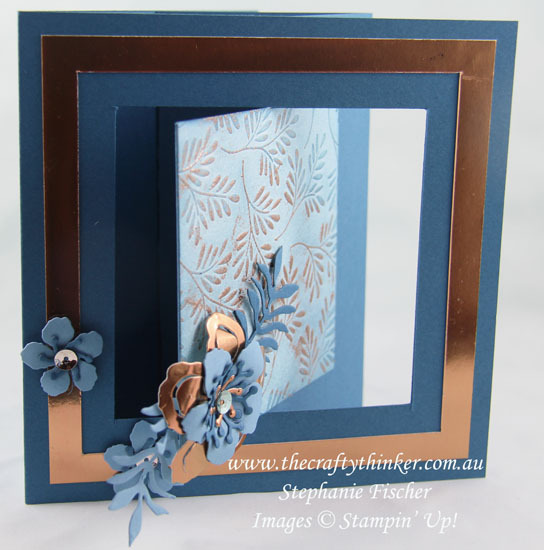 I used the Botanical Builder Framelits to create the floral decorations with Copper Foil Sheet, Dapper Denim and Marina Mist cardstocks. 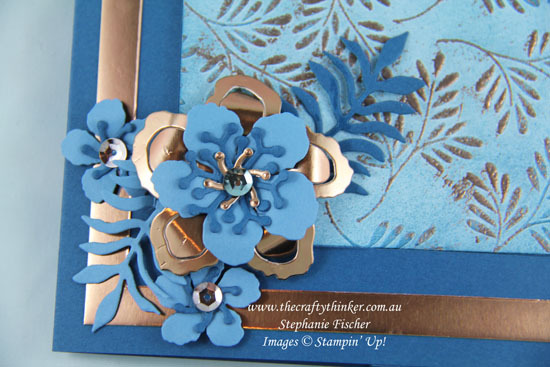 I used Fancy Frost sequins for the centres of the flowers. I adhered a piece of Marina Mist cardstock to the inside back of the card and stamped a greeting from the Tin of Cards stamp set in Basic Black ink. 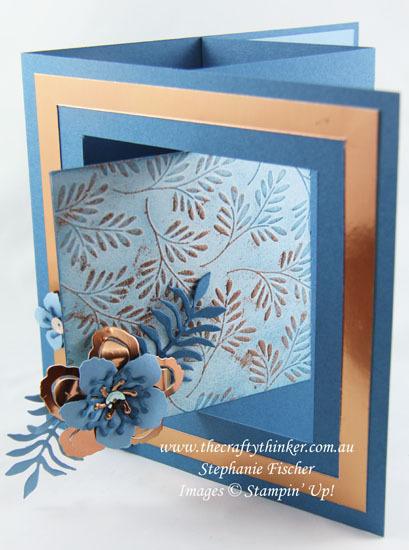 I added some little Copper Foil blossoms that were cut with the Bloomin' Heart Thinlits. The other part of the card, I decorated with the remainder of my Fancy Frost paper and a greeting from the Hostess stamp set called Gift of Love. I used this greeting because it epitomises my friend - she is so incredibly loving, nurturing and caring that it's a wonderful gift that she gives to the world. 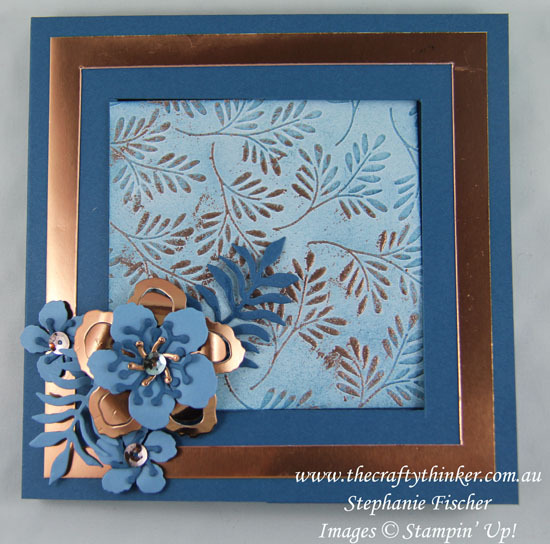 I stamped it onto Soft Sky cardstock and cut it out with one of the new Stitched Shapes Framelits whch I layered onto a piece of Copper Foil cut with one of the Layering Squares Framelits and added a couple more of the Bloomin' Heart little blossoms.